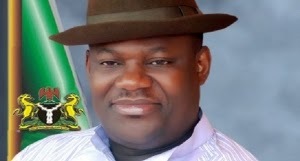 The defection of erstwhile Deputy Governor of Rivers State, Engr. Tele Ikuru, from the All Progressives Congress (APC) to the Peoples Democratic Party (PDP) has been described as good riddance to bad rubbish by Rivers APC. In a statement he issued on Sunday in Port Harcourt shortly after Ikuru announced his defection, Rivers APC Chairman, Dr. Davies Ibiamu Ikanya, said: “Contrary to the thinking in some quarters, the defection of Engr. Tele Ikuru did not come to us as a surprise. Rather than being shocked, we feel relieved that he is no more part of us because Ikuru was a PDP mole in our midst. Unknown to most people, Ikuru initially refused to leave PDP for APC with Governor Rotimi Amaechi in November 2013. However, after series of meetings with his uncle and political mentor, Chief Uche Secondus, the National Vice Chairman of PDP, and some other PDP bigwigs, he was prevailed upon to follow his principal into APC. Dr. Ikanya disclosed that PDP and Engr. Ikuru’s calculation was that Governor Amaechi would be impeached by hook or crook to clear the way for Ikuru’s assumption of office as governor. According to him, “In keeping with the plot of making Ikuru the substantive Governor of Rivers State, PDP set in motion a machinery to use five misguided members of the State House of Assembly to impeach the Speaker, but the move was foiled by the Majority Leader, Hon. Chidi Lloyd, and other loyal members of the House. The plan was that after impeaching the Speaker, the five renegade lawmakers would go ahead to impeach Governor Amaechi and subsequently declare Engr. Tele Ikuru as the substantive Governor. Dr. Ikanya said that when all this failed, Engr. Ikuru was asked to remain in APC in the hope that the party would give him its gubernatorial ticket or a senatorial ticket. “When this failed his uncle, Uche Secondus, advised him to stay on but this time to destabalise APC in his Andoni Local Government Area. Towards this end, Engr. Ikuru pocketed hundreds of millions of naira meant for the development of the party in Andoni and threw in the towel as he was about to be called to account for anti-party activities. We are, therefore, expectedly relieved by his exit and wish to call on our teeming supporters not to shed a tear as it will have no effect whatsoever on the fortunes of APC and its candidates in the forthcoming general elections in the State,” the statement concluded.